7. Dwayne Roloson, New York Islanders. Tribute mask designed by Jesse Acciacca, 2011. One of the only decent style masks from this NHL season, but you can see how this ultra-modern look can be kind of whatevs. Acciacca does do work for Motley Crue, so that kind of tells you what’s up with modern hemet design. What's more important here however, is the bold use of New York Islander colors, including the matching orange on the cage. 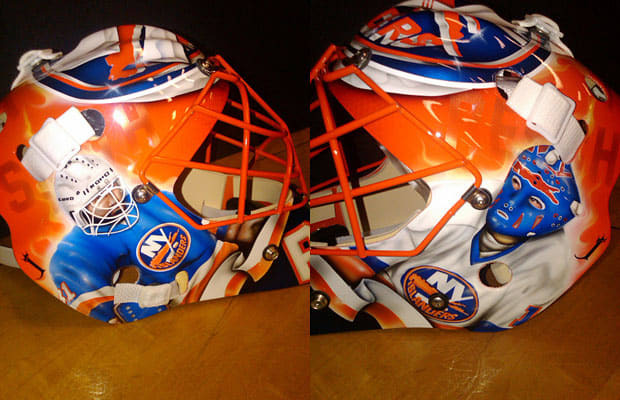 Unfortunately for Roloson, he got traded about a week after debuting this mask.